This gentleman came to see me for a fractured upper left front tooth which was then heavily infected. Time for this treatment was of the essence as the patient was getting married in six months. What was of particular challenge was that he presented with a high smile line i.e. he showed a lot of his gums whilst smiling. This does pose a challenge during implant reconstruction as getting the gum margins to the right level is of very high importance. Due to the extensive nature of the infection, I had to undertake a simultaneous bone augmentation procedure prior to the final crown being placed. 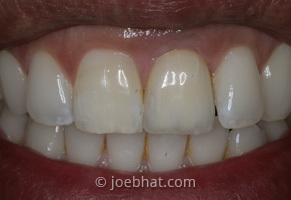 This treatment took less than six months to complete and Mr M was delighted with the final result. The testimony for this case was a lovely wedding photo that he sent to me at the end of his treatment! The cost of a treatment of this nature is £6,010. This delightful lady was referred to me as she hated her existing upper partial denture which she was using to replace her missing upper right front tooth. This young lady was socially embarrassed by the fact that she wore a removable denture at her young age. 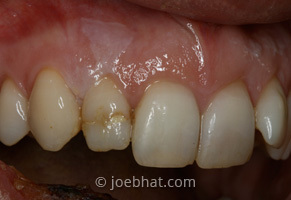 The tooth was previously extracted due to heavy infection and had lost considerable amount of bone. 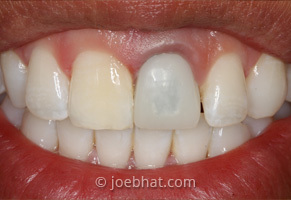 The treatment carried out included a standard bone grafting procedure and implant reconstruction with a final crown which was colour matched to her adjacent tooth. The treatment was entirely undertaken under local anaesthetic and took five months to complete. The cost of a treatment of this nature is £3,360. 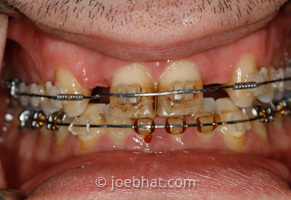 This gentleman was undergoing orthodontic treatment for a condition of hypodontia. 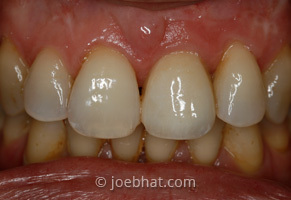 In this condition, teeth are congenitally lost or missing and this can cause a big aesthetic problem in later life. 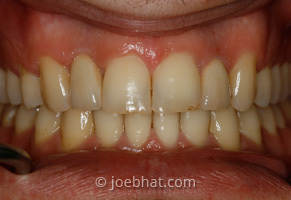 My specialist orthodontist repositioned the teeth to the ideal location and referred him to meet for implant replacement of the two missing lateral incisor teeth. The implant treatment was undertaken prior to the completion of orthodontic treatment and the crowns were fitted at the time of removal of the braces. 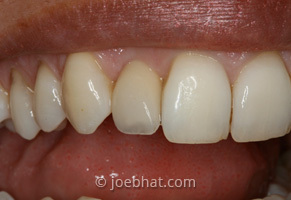 This allowed us to work as a team in providing the patient with the most ideal outcome in the shortest period of time. The entire treatment including orthodontics took 18 months to complete and the cost of the implant treatment came to £5,740. This lovely lady sustained trauma to her upper front teeth whereby she fractured her upper right second front tooth in a bleak fashion. The tooth unfortunately could not be saved and had to be extracted. Considering that the patient was in her 30s, we needed to provide a high aesthetic outcome. The fractured tooth was duly extracted and replaced with a dental implant and the final restoration placed in less than five months from the time of injury. 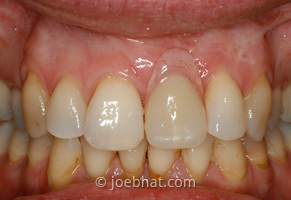 During this interim period, the patient wore a provisional bridge as she could not tolerate a removable denture. The treatment was carried out under local anaesthetic at a cost of £3,955 as it was a case where careful consideration needed to be given to the final aesthetic outcome.